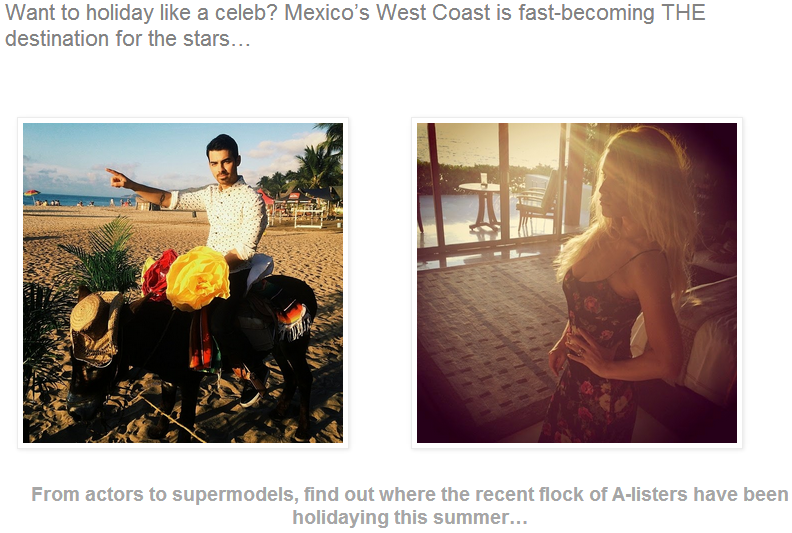 A press release detailing the celebrities who had visited the area was sent out through the PR agency hired by the Riviera Nayarit CVB in the UK to help promote the Vallarta-Nayarit campaign; it lead to a preliminary count of over 11 million impressions. Celebrities’ visits to the region were tapped by the public relations agency retained by the Riviera Nayarit Convention and Visitors Bureau (CVB) in the UK to entice the British market and promote the Riviera Nayarit and Puerto Vallarta. The press release sent out by the agency compiled a list of the stars that have visited the region and was published by five British media with followers in other European communities. Taking into consideration the number of unique monthly visitors of these sites we can estimate a preliminary figure of more than 11 million impressions. These media publish topics such as travel, luxury, lifestyle, real estate, finance, technology, culture, gastronomy, etc. The list (with number of unique monthly visitors) includes: Female First (2,800,000), Luxury Travel Magazine (28,788), EIN News (2,056,659), Easier (11,964) and Veooz (6,355,847). The agency’s work was made possible thanks to the funding extended by the Government of the State of Nayarit to the joint Vallarta-Nayarit campaign; the Riviera Nayarit CVB earmarked part of this budget to help promote the new flights from Manchester and the UK operated by wholesaler Thompson and TUI airlines. The English market is vast and its healthy economy creates tourists with deep pockets. Celebrities are trendsetters and Europeans tend to follow their lead. The list of personalities that have visited the area and have helped entice new visitors includes the Kardashian sisters, Jessica Simpson, Joe Jonas from the Jonas Brothers, Alessandra Ambrosio and Bella Thorne, among others. PR MediaCo web site http://prmediaco.com/.